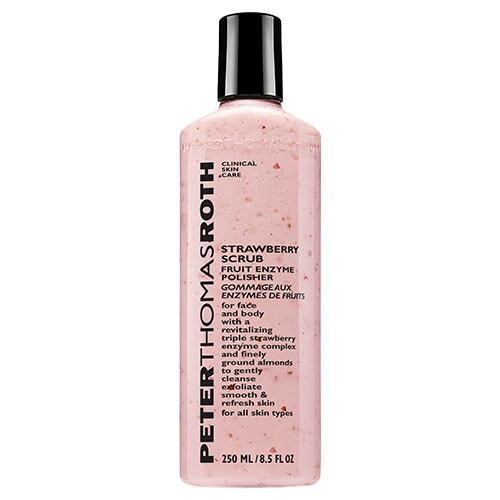 Peter Thomas Roth Strawberry Scrub Fruit Enzyme Polisher is a revolutionary exfoliator which provides an instantly brighter, healthier and more youthful complexion. Infusing the best qualities of the ultimate refreshing Strawberry, Strawberry Scrub Fruit Enzyme Polisher works tirelessly to buff away impurities and imperfections whilst sumptuously indulging and hydrating at a cellular level. Containing high levels of Vitamin C, this deliciously enchanting facial scrub masterfully adds a touch of brightness to the complexion effortlessly. Featuring Finely Ground Almonds, Strawberry Scrub Fruit Enzyme Polisher is able to remove dead skin cells that can eventually cause harm to the skin by trapping dirt and daily grime. Perfect for all skin types, this beauty essential is so gentle yet so effective, making it the ideal exfoliator for any beauty junkie. Fresh Strawberry Cells have been specially extracted and microcapsulated for ultimate performance and nourishment and help to tone, purify and moisturise the skin whilst Strawberry Puree utilises the skin, pulp, juice and seeds of the fruit to nurture the skin with vital Vitamins and Minerals for added anti-ageing benefits. Allow the power of the Strawberry to purify, soften and rejuvenate the skin with Strawberry Scrub Fruit Enzyme Polisher.